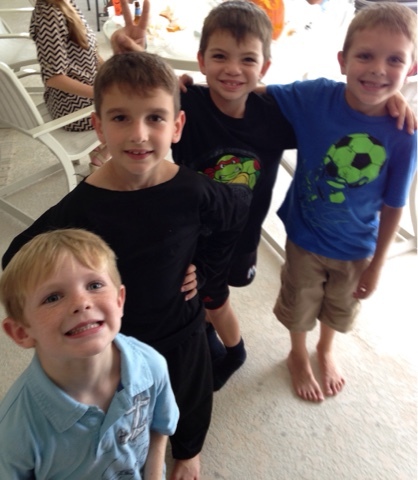 Awww.. Look how little they were! Have the Appropriate Supplies: We have a TON of pumpkin carving tools and books for everyone to use. We tell people to bring their own pumpkin… and we have everything else. You want to invest in a few GOOD knives (the ones that come with the kit are a bit flimsy) We have also invested in a little electronic saw. I hit up Walgreens or CVS the morning after Halloween and pick up carving supplies for the following year at 70% off. Set the Scene: I like to decorate the house and have fun serving ware. I got a bunch of fun goblets, bowls and plates at the Dollar Tree. Halloween party radio from Pandora is pretty good for music. It plays all the old school favorites and nothing too scary or inappropriate for the kids. My husband also fills containers with colored water and tosses in some dry ice for fun! Spooky Food: It is always fun to serve up some spooky food to go along with the theme. I have had Halloween cupcake decorating for the kids in the past. I also had skull shaped ice, which was cute for the kids drinks. You can find a TON of inspiration on Pinterest. 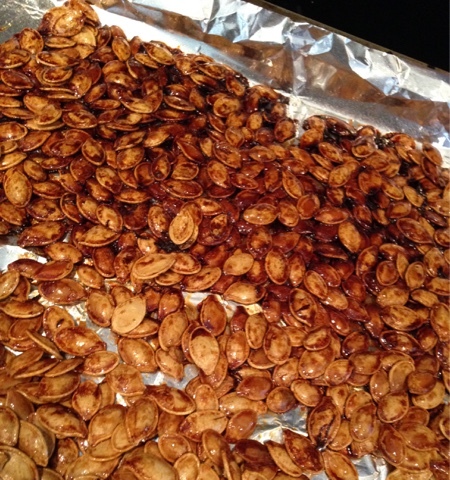 I tried to make honey roasted pumpkin seeds, and while they did look & smell amazing… they didn’t taste very good. I think they were a tiny bit overcooked. At least they made the house smell good! Have a Plan: When you have a bunch of young kids involved, we quickly realized we needed a plan when it came to prepping the pumpkins. Now the guys gut and prep all the pumpkins at once, while the kids play or do a craft I will have ready for them. It helps get everyone to the ‘fun’ part a lot quicker. 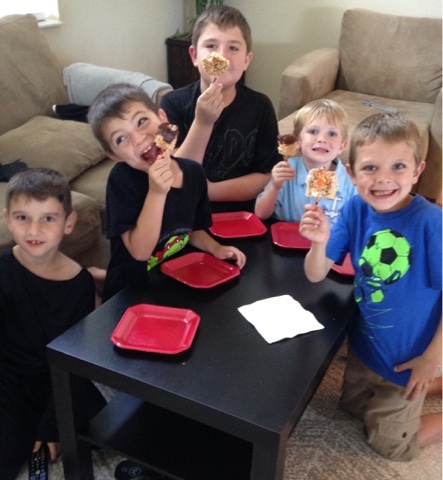 Take Pictures: In all the excitement, you may forget the most important part… pictures! We always put all the pumpkins together and get a group shot. 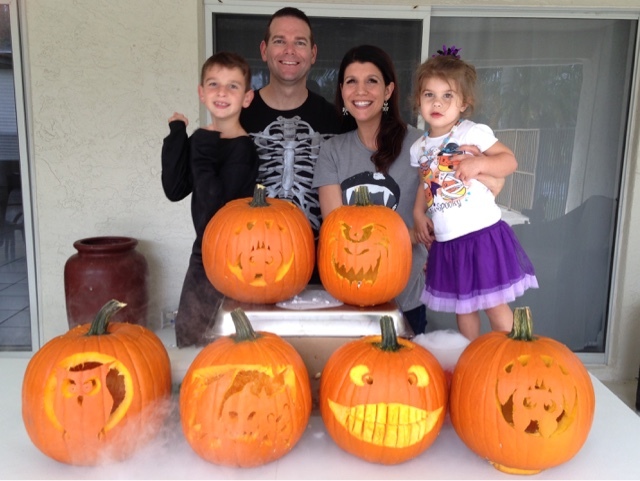 (after we all vote for the ‘winner’) I love this tradition and looking back at the kids and pumpkins they created is always fun! Pumpkin Carving Party! Preparing Your Child for A New Baby December Family Favorites Scary Cheap Halloween Decorations! Great tradition to have! I was too busy workig on my costume to have time for a pumpkin unfortunately. Well the costume is the most important part!! 🙂 I hope it turns out just how you want it! Thank you! Yes pumpkin carving is a big thing with all of us.. we even choose a winner! ha! It is a lot of fun, I was kind of bummed we had to do it on a Sunday thig year, since it usually turns into a mini party! Fun! I have never used a stencil. We carved one last week and it probably won't last until Halloween. We are pumpkin stencil addicts. My mom got me started with them when I was a kid! Oh, this is so cute! I used to carve pumpkins with my dad. We used a special knife each time that would have been my mom's brother's (he sadly passed away when he was very young). I'm looking forward to finally carving a pumpkin with Eve tonight or tomorrow! I hope you have fun! 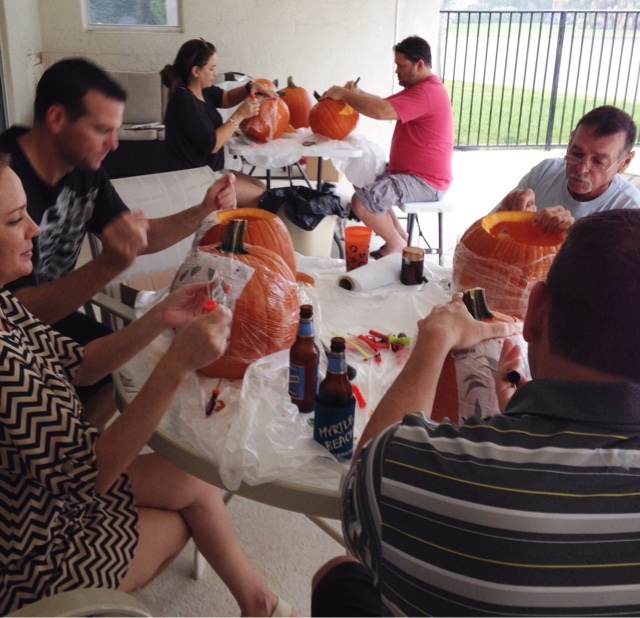 That is such a sweet tradition to honor your mom's brothers memory..
Oh my goodness, what a fun tradition…and it looks like everyone is quite a good carver! OMG. I have never curved a pumpkin before. It looks really fun. I might try it next year. This looks super fun! 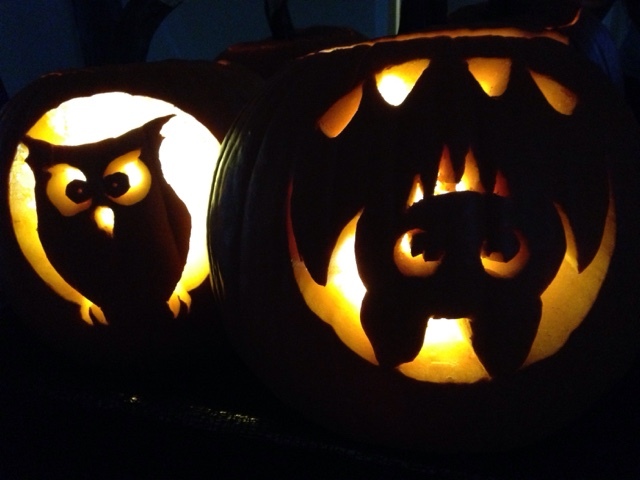 We always carve pumpkins, and last year we did it with our teen group… that was a kick! It is such a great tradtion! 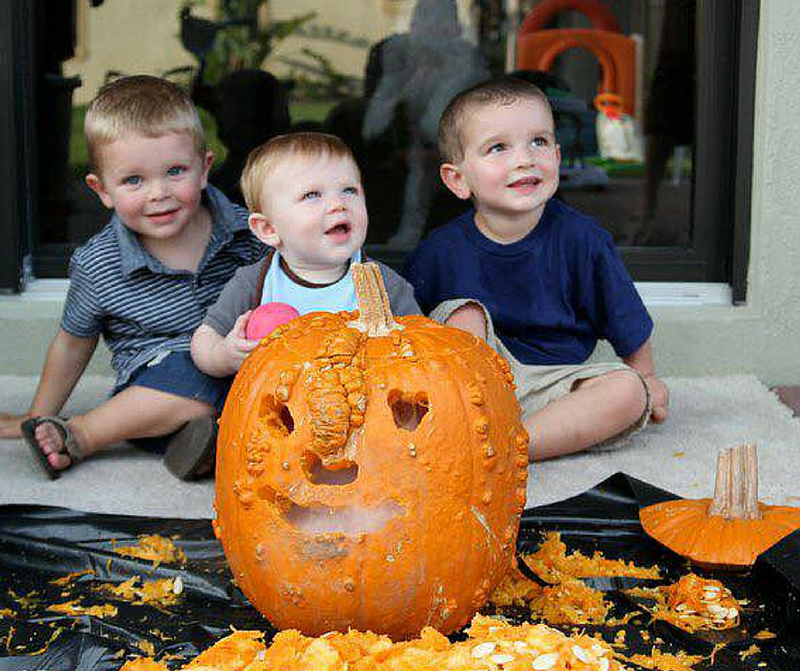 You are almost as crazy about pumpkins as us! But wait, teach me oh wise one…what's with the saran wrap? This looks so fun! And I'm sure you're right.. FL heat ain't no joke on those things lol! LOVE this!!! how incredibly fun!! The pumpkins turned out amazing! Your pumpkins turned out great!!!! Love all your ideas! Love the pumpkins! It's the same for us, way too hot. We just got ours and if I cut them we do it right before Halloween. It would be fun to having a carving party.